The state of Turks-Karakhanids, that defeated the Samanid state, to the end of XI century disintegrated into small domains. Resulting from the internecine wars the state of Seldjuqs was divided into two parts - the East and the West. Merv became the capital of the East-Seldjuq state. Merv was flourishing under the sultan Sandjar (1118-1153), but in the XII century it was invaded by the nomads. Merv was devastated and robbed by the Oghuz tribes revolted against Sandjar in 1153. Uprising of the Oghuz people stroke a hard blow to the East-Seldjuq sultanate that decomposed into a lot of small domains. Khwarazm Shahs - the recent vassals of Seldjuqids availed themselved of the opportunity and occupied Khurasan, During 80-90-ies of the XII century the Khwarazm rulers subdued Mawarannahr and Iran. In the first half of the XII century East Turkistan and Semirechye (the "Land of Seven Rivers") were conquered by Kara-kitais. 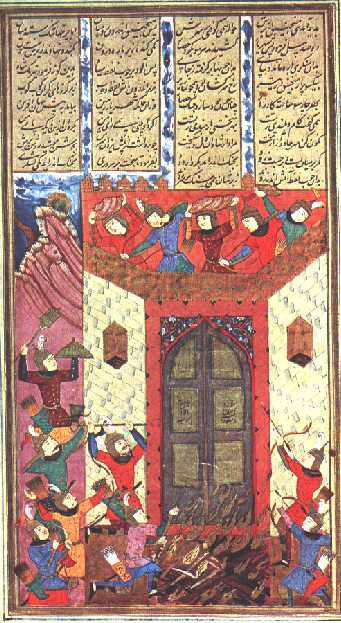 In 1141 in Mawarannahr there was a collision between the forces of Seldjuks and Kara-kitays. 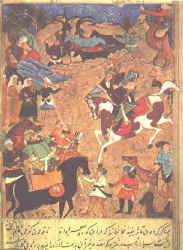 The Sultan Sandjar took to flight to Termez, in 1141 Kara-kitays occupied Bukhara. Meanwhile the Khwarazm Shah Atsyz made peace with Kara-kitais and committed himself to pay annual duties - 30000 dirkhems in gold. Profited by weakening of the sultan Sandjar, Atsyz attacked Merv and sacked it, but he could not hold out in Khurasan and in summer this year the power of Sandjar was restored. In 1143-1144 sultan Sandjar took a campaign against Khwarazm, made Atsyz to submit and return all robbed treasures. Having failed in his aspirations towards creation of the independent state and occupation of Khorasan, Atsyz again turned his eyes to the banks of Syr Darya and was defeated by the Khwarazm Shah. Despite all his efforts Khwarazm Shah Atsyz could not achieve his goals and died being the vassal of Seldjuqs. But, nevertheless, by adjourning Jend and Mangyshlak to his possessions he made neighboring nomads dependent of Khwarazm. He added his armed forces by Turkic troops and made a good start to a strong and really independent state. Due to the efforts of the Khwarazm Shahs their state in the XII century became one of the strongest states in Central Asia. Under Tekesh the borders of the Khwarazm state extended as far as the borders of the Khaliphate including Khorasan and Iran. 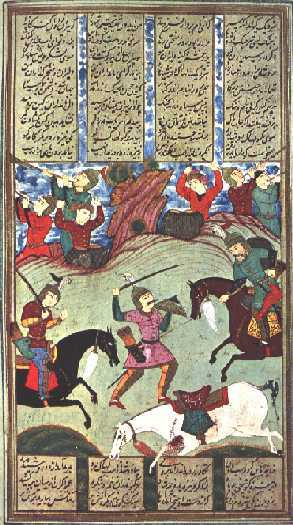 At the beginning of the XII century Mukhammed ibn Tekesh took a campaign against towns near Syr-Darya where he met the army of Kara-kitays under the leadership of Tayaku. Kara-kitays were defeated, and Tayaku was captured and conveyed to Khwarazm. On his way back the Khwarazm Shah Mukhammed ibn Tekesh took possession of Utrar and other towns near Syr Darya. The ruler of the Utrar town, Khasan ibn Abd al-Khalyk was killed, and this event signified the end of the Karakhanid dynasty in Utrar. After the death of Khasan ibn Abd al-Khalyk Kayr-khan (Gaiyr-khan) became the ruler of Utrar. To confirm his possession of towns near Syr Darya Mukhammed ibn Tekesh started to mint silver coinage under his authority in the town of Yasy. In 1007 he took a campaign against Mawarannahr, but soon, in the battle with Kara-kitays, he again was defeated together with his Samarkand ally. Invasion of the Naimans from the East under the leadership of Kuchlug lead to the end of the supremacy of Kara-kitays in Central Asia. 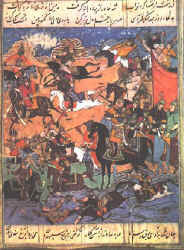 In 1210 Kuchlug assisted by the Karluks crashed the army of Kara-kitays. This was the end of the power of Kara-kitays in Mawarannahr. The state of Khwarazm Shahs remained after governing of Kara-kitays on the whole territory of Central Asia. After that in the official papers Mukhammed ibn Tekesh was named as Alexander the Great the second. At that time the state of Chinggis Khan located in the steppes of Mongolia gained strength. According to Rashid ad-Din, for the first time the Mongolian forces met the army of the Khwarazm Shah in 1217. That time the Mongols went back to return in two years. 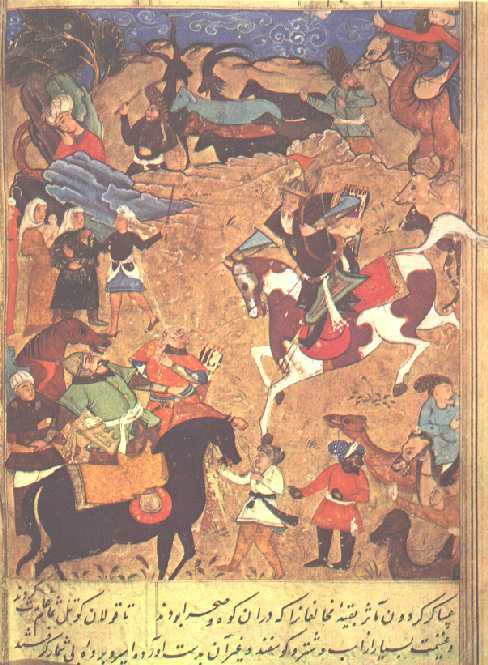 In 1219 the Mongols started their invasion to Turkistan and Mawarannahr. From the 2-nd half of XIII century the trade renewed, the cultural life of towns revived. At the beginning of the XIV century Uzbek, Khan of the Golden Horde adopted Islam that became the state religion. In the process of adoption of Islam by the Golden Horde Shaykhs of Yasawi tarikate, the followers of of Zengi-ata Sadr ad-Din Shaykh - Baba Tuklas, Saiyd-ata, Badr-ata, Uzun Khasan-ata played the major role. From the middle of the XIV century a new state of Chinggisids appeared in Mawarannahr and steppes Desht-a- Kipchak. In the XIV century in Central Asia there were several states - the Golden Horde, the Ak Horde, the state of Timur, Moghulistan. At the end of XIV century the state of Timur subdued the greater part of Central Asia. During these centuries such world-known scientists as Akhmed Yugnaki, Ahmad Ata Yasawi and many others were born in Central Asia.